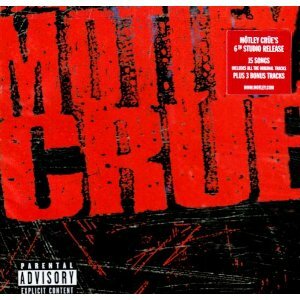 Hall of the Mountain King: Still Spinning: Motley Crue, "Motley Crue"
The nearly 20 years between Crue’s best-selling Dr. Feelgood and their 2008 comeback album Saints of Los Angeles, were not always kind to the band. There was 1997’s absolutely awful reunion record Generation Swine, which featured a mish-mash of alternative-tinged attempts to be relevant, songwriter Nikki Sixx working out his punk fetish, songs that were written for John Corabi and not suited to Vince Neil’s nasally vocals and misguided tributes to children and wives. If you’re looking for Crue’s worst moment, this is it. It was about as big a mess as the hard rock world has ever seen and about as far from what you want in a Motley Crue record as you can get. After that, drummer Tommy Lee parted ways with the band, resulting in 2000’s New Tattoo, which seemed almost a response to the backlash of Generation Swine. It ran away from the modern sounds of that album, dipping too far back into their 1980s repertoire and coming off a little tired and generic. There were also more compilation albums during that span than you can count before they finally got it on track and got back to doing what they do in 2008. The bright spot from those years, though, was the 1994 record with John Corabi. Not only is it not Crue’s worst record. To me, it’s among their best. Corabi, former vocalist of The Scream, brought a second guitar and a gruff, ragged edge to the vocals. It was a stark contrast to Neil’s high-pitched tones, and though I may earn the ire of many Motley Crue fans – one that lives with me, included – by saying this, Neil’s vocals can’t touch what’s on this record. Corabi’s voice also brought a rougher, heavier edge to the music. Though many Motley Crue fans dislike the album because of Neil’s absence, no one can deny that it’s the band’s heaviest and most mature record – mature, of course, being a relative term where Motley Crue is involved. Lyrically, the songs are still littered with drug references and party themes, but musically, there’s a definite growth. Nowhere is the shift more pronounced than on my personal favorite track, “Welcome to the Numb.” It opens with a slide riff from Mick Mars with heavy effects, then morphs into a good old-fashioned hard rocker. Mars continues to rip it up on the slide, and the song has a great chorus hook. Corabi also gets a chance to show off his harmonica skills. There are some really nice Aerosmith blues rock influences on the track, and the album in general. That comes out again, along with some ‘70s glam rock influence on “Poison Apples,” which name-drops Mott the Hoople and drops references to several other bands, including Aerosmith. The dark groove of “Til Death Do Us Part,” which was originally the name of the album, is a throwback to the more dramatic hard rock of the 1970s/early ‘80s with small traces of Whitesnake and Led Zeppelin. There were, of course, several ballads, but for the most part they weren’t the typical three-chord 1980s love songs. “Misunderstood,” one of the singles from the record, was closer in structure to something from Soundgarden’s Superunknown, featuring a chorus with sitars and mandolins – instruments you don’t expect to find on a Motley Crue record. The track also kicks into gear about halfway through with a swaggering hard rock section. Glenn Hughes has a guest spot on the song, but is woefully underused, providing only backing vocals and getting largely lost. “Loveshine” was a love song, but had a heavy Led Zeppelin vibe to it. The final, “Driftaway,” is the most typical and least memorable. On the other end, the heaviest song on the record is “Smoke the Sky,” which features a chunky, driving riff from Mars and some impressive screeches from Corabi. There’s also a nice stomping heavy breakdown in the middle of the song. Mars’ riffing was potent all over this record as he found his groove on tunes like “Hammered” and “Uncle Jack.” There are great grooves all over Motley Crue. Corabi’s vocal range brings a depth to that aspect that the band had never had before, and even Lee and Sixx turn in some of their best work. Whether fans liked him or not, John Corabi seemed to raise the game of all of the band members, and from a purely musical standpoint, this might be Motley Crue’s most impressive effort. As much as I like it, even I’m guilty of overlooking the album, and every time I return to it, I’m stunned by just how good it is. It might not sound exactly like what you expect from Motley Crue, but it’s one hell of a rock ‘n’ roll record.